Peterborough Phantoms have been pipped to title glory by Basingstoke for the second time in three seasons. The city team missed out on the NIHL Division One South crown on goal difference after Bison thumped bottom side Cardiff Fire 8-1 on the final night of the regular season (March 11) to secure the silverware. Phantoms matched the Hampshire side’s tally of 56 points during the 32-game league campaign, but the Bison managed a +98 goal difference compared to the +90 of Phantoms. Basingstoke also beat Phantoms to the English Premier League title in the 2015/16. 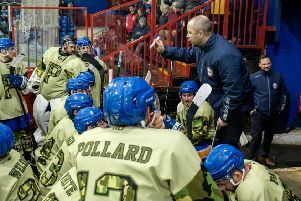 Phantoms head coach Slava Koulikov was quick to praise the champions and is confident his men will raise themselves for play-off battle, which begins this weekend. He said: “I pass on my congratulations to all Basingstoke players and staff on winning the league. “It is now time now to switch our focus to the play-offs and we are looking forward to getting started. Phantoms now face seventh-placed Milton Keynes Thunder in the opening round of the play-offs. They have home advantage in the first leg on Saturday (March 17, 7pm) at Planet Ice ahead of a return clash in Buckinghamshire the following night. Should Phantoms make progress to the semi-finals, they will be at home in the second leg on Sunday, March 25. The NIHL Division One South play-off final then takes place over the Easter weekend (March 31/April 1) ahead of the ‘Final Four’ weekend in Coventry (April 7/8) when the South finalists face the NIHL Division One North finalists to determine overall play-off champions.